Graxias is the slang spelling for gracias in Mexico. It’s the same way in which some people nowadays spell the word girl as gurl.! It’s about pronunciation, being kool rather than cool, and hip.!! And it’s just one of the many blessings I am grateful for this Thanksgiving. Of course, I am grateful for my friends, my family, my home, and my job.!! It’s been a rollercoaster year, but I’m grateful to be alive and present. I’m not cooking this year…just making pumpkin pie…or several.! 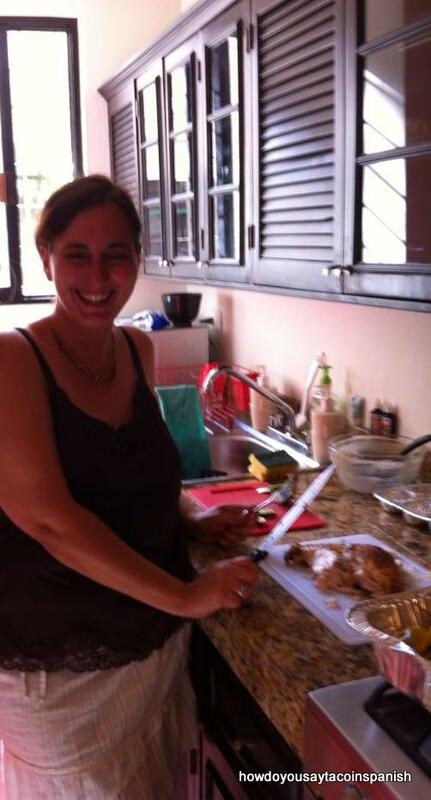 When I was in Playa, I alternated between cooking (the year I had a stove!) 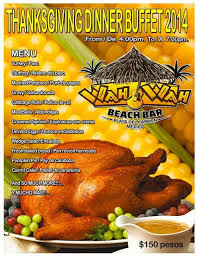 and going to one of the many restaurants that served Thanksgiving dinner such as Wicky’s or Wah Wah Bar.! 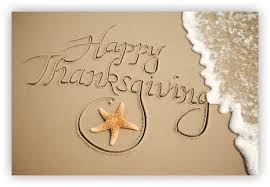 Happy Thanksgiving everyone.!! See you Friday.!! Feliz lunes.!! Happy Monday.!! I hope everyone’s weekend was amazing.!!! Mine was delightful 🙂 It was so action filled that I passed out every night from sheer exhaustion.!! On Saturday, I spent a lovely afternoon at a friend’s birthday party.! And I ate way too much delicious yellow cake filled with fresh fruit.!! Yummy.! Then on my way to my father’s for dinner, I got an oil change. Yeah, I know…over-achiever. And I stopped at the cemetery since it was my mom’s birthday weekend. I wanted to bring her fresh flowers because I know she always loved them so much. And I left some for my brother too. Though I’m sure he couldn’t have cared less about the flowers 🙂 I had a nice time with my dad. It was good to see him in decent spirits. Then on Sunday, I spent the whole day baking and cooking in memory of my mom. I wanted my house to smell just like it did when I was growing up and she was cooking in the kitchen.! Mission accomplished.!! 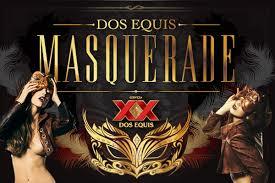 Once again, this weekend’s Dos Equis’ commercial has nothing to do with anything in my life. Except that it’s been a long time since I’ve worn jean shorts.! jajaja… I know you’re dying to know how the Most Interesting Man in the World feels about jean shorts.!!! Ok…gotta go now. I want to see how my pumpkin pie turned out 🙂 Enjoy.! Y salud.!! It’s my mother’s birthday this weekend which of course is bittersweet. But this weekend, it takes on extra poignancy because the following week will be 10 years since she passed on. Not a day goes by that I don’t think about her or wish I could call her. She was not just my mom…she was my best friend. So, in that spirit, I would like to revisit the Kahlúa blog post because it’s about my mom. And she would have enjoyed it because she had a wicked sense of humor.!! jaja… Salud.! Y mama, feliz cumpleaños.! Everyone always asks me – “Why did you go to Mexico?” or sometimes just simply, “Why Mexico?” I give them my standard answer – it’s pretty much my blurb on the About page – I worked for Starbucks for 12 years then I got a degree, my thesis is on fair trade coffee….blah blah blah. I can see I’ve already lost them. Their eyes glaze over and they just nod politely. So I’ve decided that I am going to start telling everyone a different story. It’s my mother’s fault. So for many months now, I’ve been walking by a particular statue by my job downtown. I never really gave it much thought until the other week because I noticed people kept taking their photo by the statue. Normally, I just wind my way around tourists taking pictures of the skyscrapers and the ‘Horses of Honor’ artwork decorating Michigan Avenue. 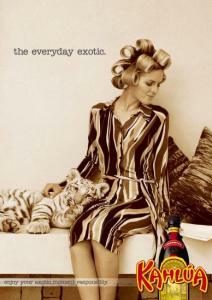 I learned how to do that exceptionally well when I lived in playa.!! But for some reason, I was intrigued. Who was this man.? Why were people taking photos with him.? And so, on a rare warm day as I strolled by, I stopped to read the plaque affixed near the statue. The plaque read – Benito Juárez.! Are you kidding me.?!? Benito Juárez.! 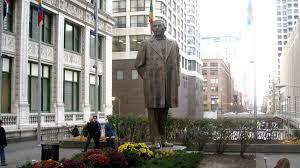 Are you telling me, there is a statue of the former president of Mexico right outside my job.?! 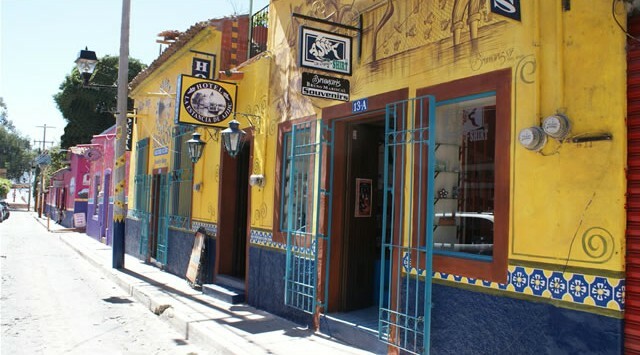 I’m sure I’ve mentioned several times in this blog that one of the main streets in Playa del Carmen is called Juárez. But who knew, Juárez would be so close to home too.!! 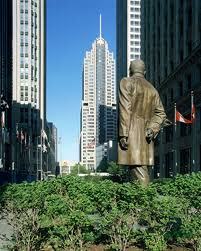 The statue was sculpted by Julian Martinez and it is located on the Plaza of the Americas between the Realtor Building and the Wrigley Building in downtown Chicago. Wow.! Feliz domingo a todos.!! Happy Sunday everyone.!! I hope everyone’s weekend was super amazing.!! Mine was bittersweet. On the sweet side, I had a glorious dinner with my neighbor on Friday evening. After weeks of scheduling issues, we were finally able to resume our Friday night get togethers. The food was great – chicken breasts and spaghetti squash – and the company was phenomenal.! Of course on Saturday, I had dinner with my father 🙂 But I also managed to finally have a cup of coffee with a dear friend before dinner.! Also after weeks of budget conscious penny pinching, I was able to go to the hair salon and get a real hair cut 🙂 Yay me.! And I caught up with so many friends over Facebook, Skype, and the phone. I am really blessed to have so many lovely and supportive friends. Without them, I would have withered away a long time ago. The bitter part, I had to say goodbye to someone I love 😦 I hate that. I didn’t want to say goodbye, but I don’t know how to fix what’s broken. Heart you boy wonder..always have..always will. 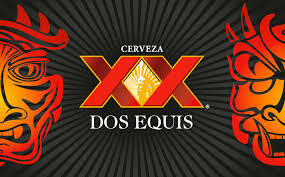 I have nothing to tie in this week’s Dos Equis’ commercial. So let’s just jump right in.! Even though Halloween has come and gone, the Most Interesting Man in the World still has some more opinions on costumes.!! Personally, I thought he was too classy for this comment…but does anybody really know anybody.?! jaja.. Have a great week my dear readers and bloggers. Enjoy.!! Y salud.!! It’s always feast or famine.! When it rains, it pours.! Yes, all those little trite-isms sum up my dustball drought of award nominations.!! But no more dear bloggers, the drought has given way to a deluge of awards.!!! Ok…not really…I only received two 🙂 But two is way more than I had last week or last month for that matter.! So on to accepting the award…. 1. 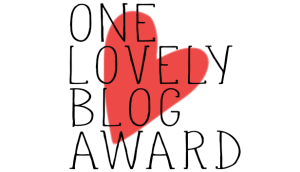 You must thank the person who nominated you and include a link to their blog. 2. You must list the rules and display the award. 3. You must add 7 facts about yourself. 5. You must display the award logo. 2. Speaking of my name, it was supposed to be Mariana. But when my mom was in labor and in no place to debate – my dad argued for Ruža. Apparently, he won. Though Mariana is my middle name. 3. Speaking of my dad, he has about 10 to 15 nicknames for me. My personal favorite is tornado.!! 4. Speaking of names, I have a lot of names.! Somehow Rose is not enough.! People call me Ruža, Rosa, Rosita, Rosalinda, Rosamunda, Rosey Posey.! 5. For some strange reason, when I worked in Mexico, they mixed up my first and middle names. So my email at the hotel was actually Mariana and my last name and not Rose and my last name. !